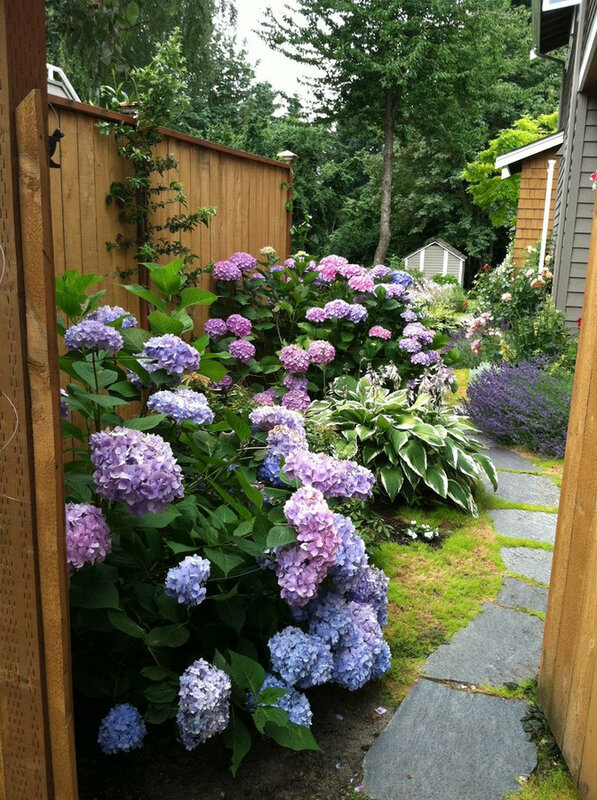 GOALS: Outdoor entertaining, many hydrangeas and roses, calm landscape, grass for kids, attractive plants in every season, good circulation throughout the property. 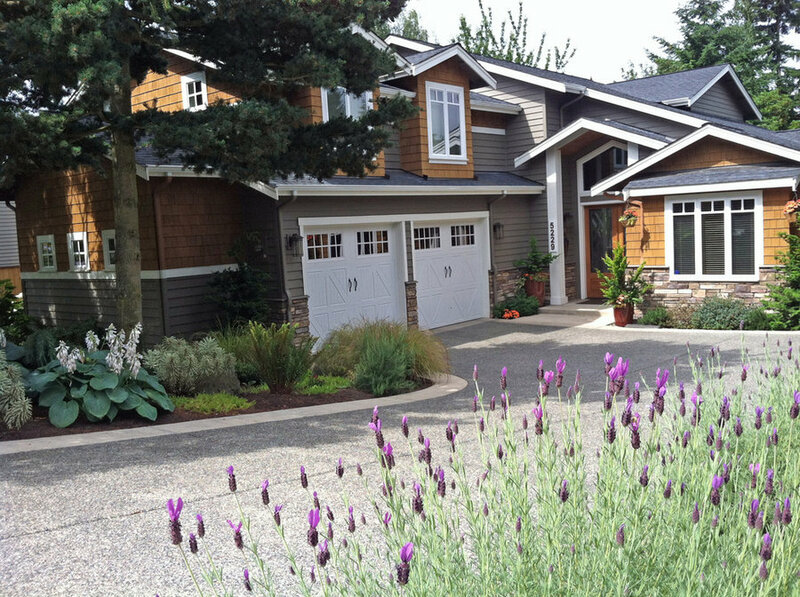 This comfortable home was almost finished when Land2c began designing the landscape. The open-concept main floor has 3 sets of French doors opening onto the partially covered terrace. 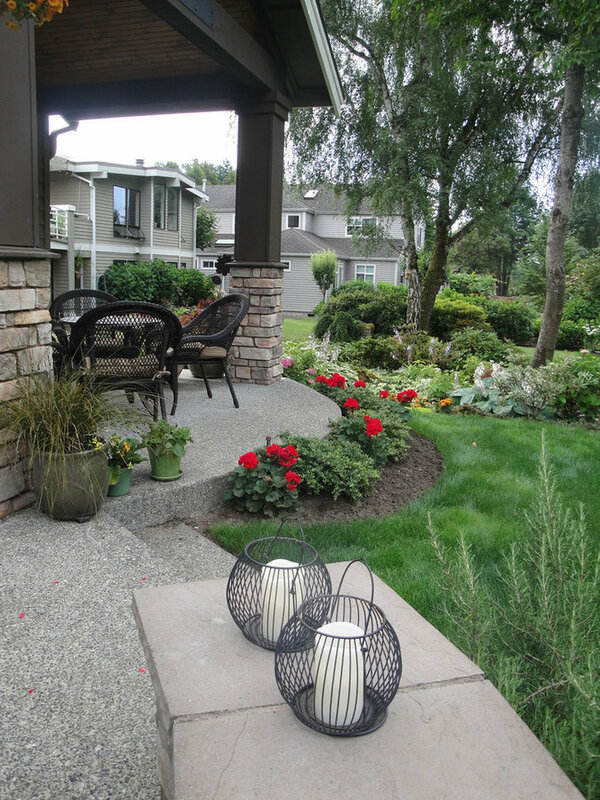 The private backyard backs up to a serene green belt. The originally planned minimal patio area was doubled in size and became three curving continuous terraces. The middle terrace has a built-in seating wall for trays of food, drink, and extra seating. The views out to the back garden from the main floor are lovely and change throughout the seasons. 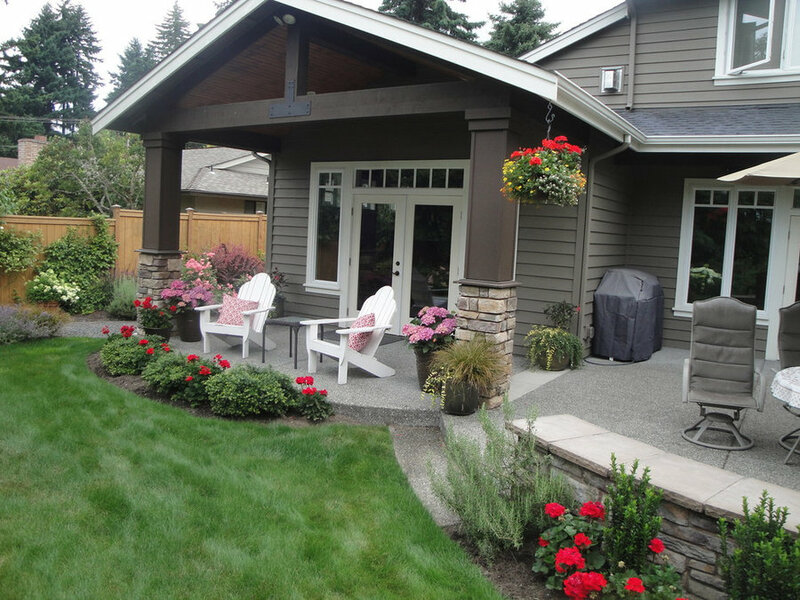 The clients are avid gardeners and the collection of their favorite plants--hydrangeas and roses--light up the garden pathways that circle the home. 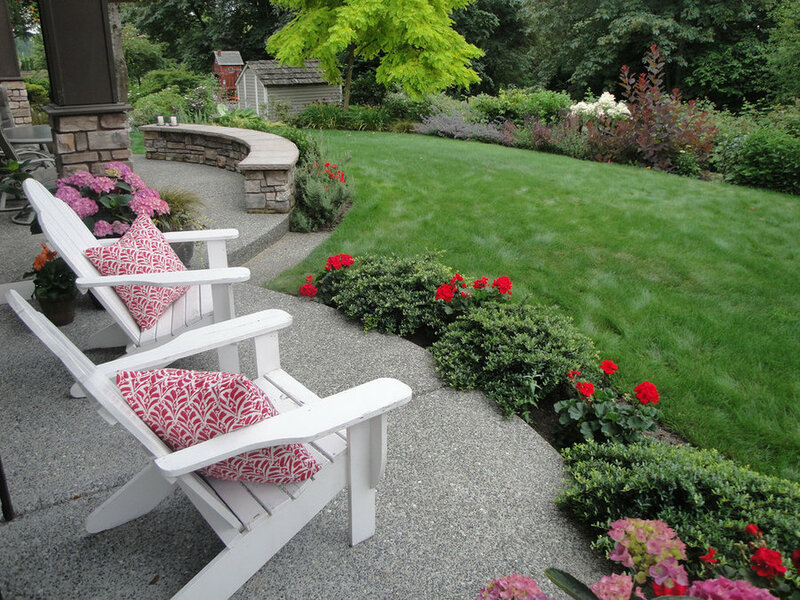 The owners enjoy home-grown bouquets all season long--just one of the benefits their landscape provides. 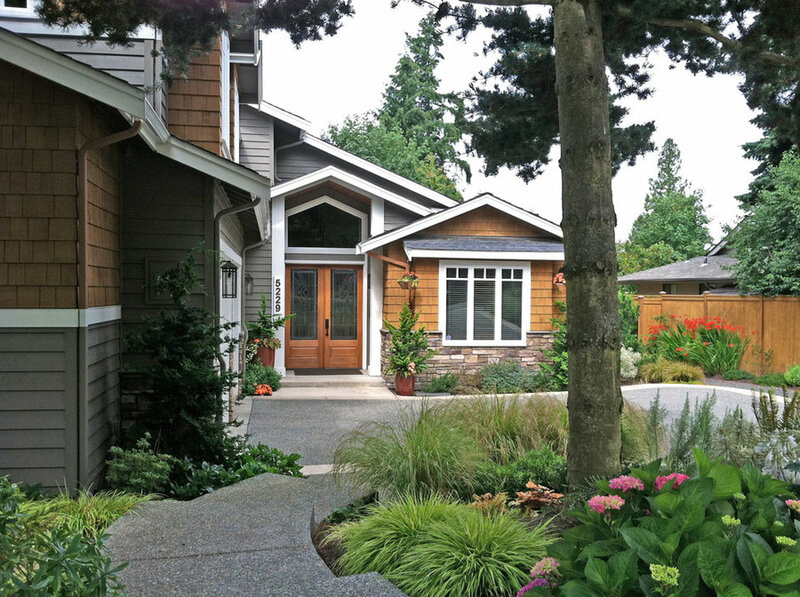 Land2c Old trees were pruned and saved adding permanence to the newly built home. The entry landscape was worked around them. A pedestrian walkway off the screen to the left curves down to the front door through the landscape. Land2c Old trees were pruned and saved adding permanence to the newly built home. The entry landscape was worked around them. A pedestrian walkway off the screen to the left curves down to the front door through the landscape. 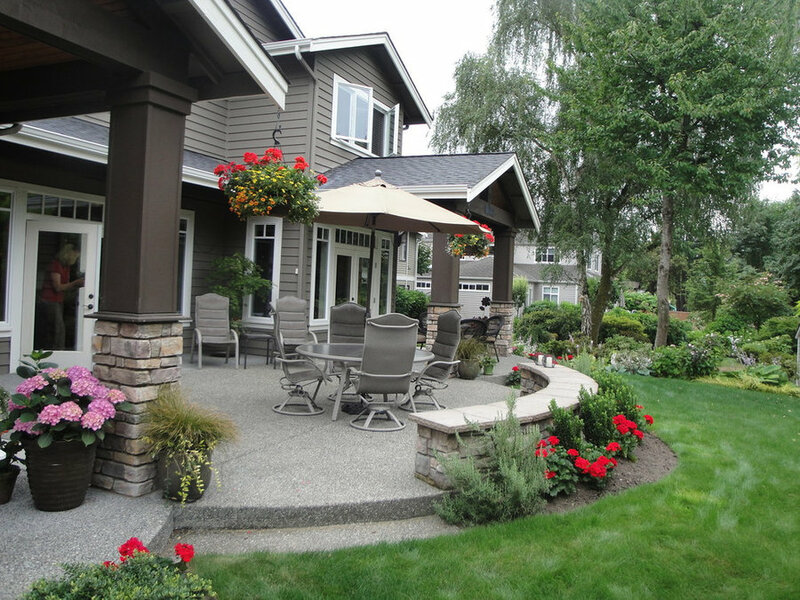 The landscape is lushly planted with collections of the owner's favorite plants. Beds are attractive throughout the year with many evergreen plants. Land2c The gradual steps work their way to the home through a lush landscape. Grasses, ferns, and maples shade the area. 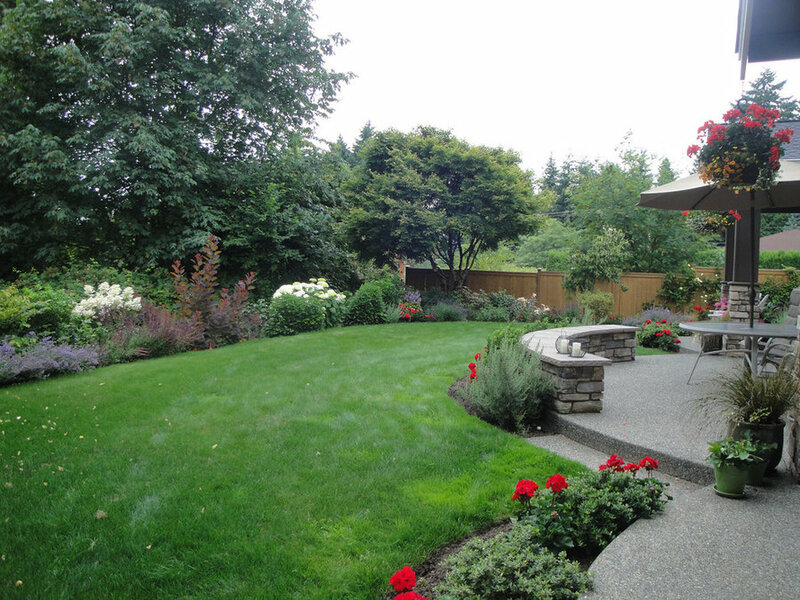 Several trees were left that add instant age to the new garden. Land2c The home has easy circulation/access around the home. This is the gravel pathway for rolling utility bins easily. Land2c The clients requested lawn and enjoy the borrowed view of the greenbelt. Many plants were included that can be cut for bouquets as requested.Three curved terraces with a center seating wall provide ample areas for entering guest and family. Land2c The entertaining areas have three separate seating groups and can handle large groups easily. The kitchen is close to the largest, central terrace and BBQ. The guests can move easily between inside and outside through 3 sets of French doors. Land2c Off the kitchen/dining room is a table for four. It is a great spot for morning coffee. 3 flowing generously curved terraces unite the west side of the comfortable home. Sets of French doors open to the partially covered large terraces. Land2c Three partially covered terraces provide ample room for relaxing and entertaining. French doors connect indoors with the outdoors. Land2c The tree back center is a bright Golden Locust. A greenbelt provides a lovely backdrop for the landscape. Seating is comfortable with three separate 'rooms' to gather in. 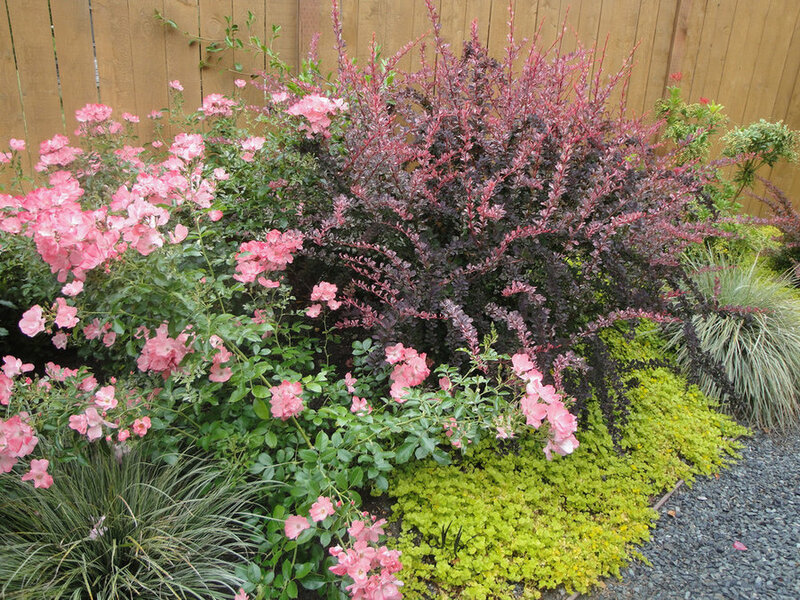 Land2c The pink low Ballerina Rose combined with the Rosy Glow Barberry is set off well with the base of blue/gray Blue Oat Grass and Golden Creeping Jenny. All tough and beautiful plants. 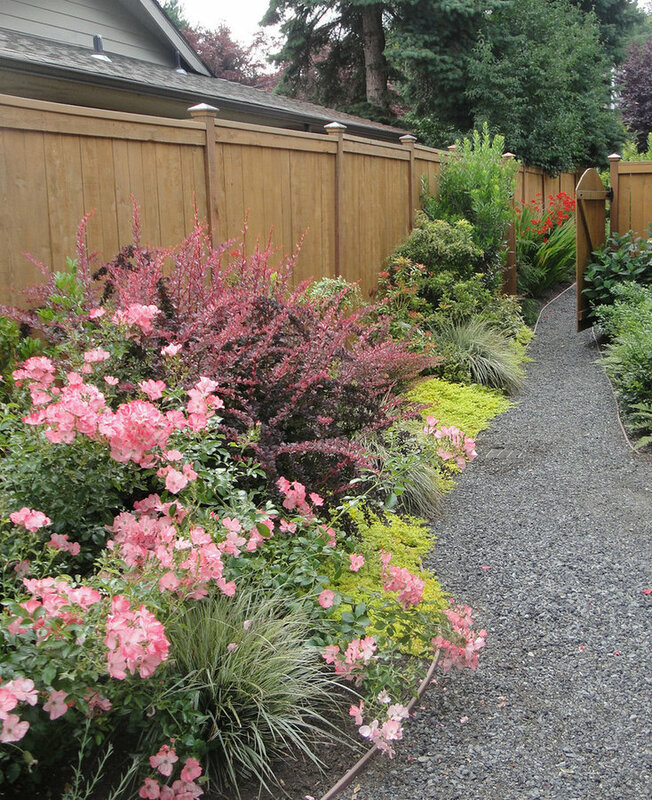 Land2c The pink groundcover rose and the Burgundy Glow barberry blend nicely with the Blue Oat Grasses and the Golden Creeping Jenny. All tough and full sun plants. 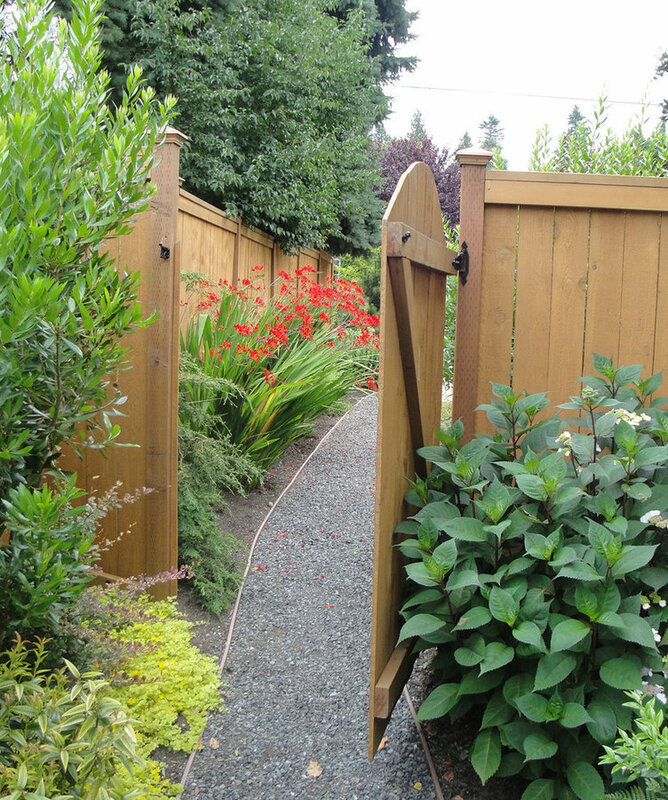 Land2c Some favorite hydrangeas and climbing roses flank a pathway. 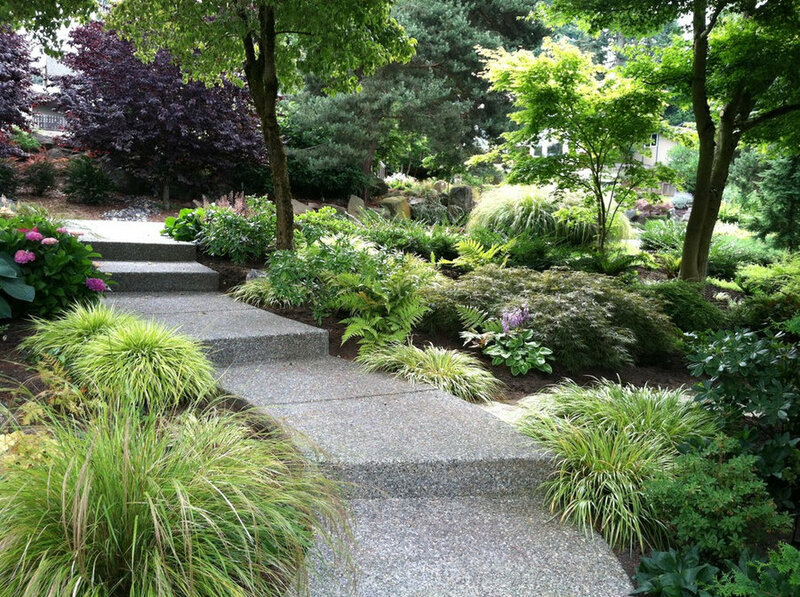 Groundcover surrounds the stepping stones with lavender and variegated hostas filling in along the curvy path to the rear garden. Many summer bouquets for filling vases are grown here!